Afghan FlatBread is the everyday bread of Afghanistan. It is also called as Noni Afghani, Nan-i-Afghan, Afghani Nan or Nan-e Barbari in Persian. Afghan flatbread is baked in variety of size and shapes and usually made with either whole wheat or All purpose flour /Maida/Plain white flour. The dough for this is left to rise and then shaped and again let to rise before baking. Traditionally they are baked in freestanding brick oven fired with wood or tandoor. Now since I do not have that, I used my oven. Sesame or poppy seeds are sprinkled on top before baking, I used onion seeds for the same. This bread is served almost every meal and is generally torn into pieces and used to wrap foods, so that they can be picked up and eaten, and also to soak up liquids on the plate and in a stew. It can also be served as a snack or a light meal with yogurt or fresh cheese and other appetizers. This bread is similar to our Naan bread. I started with this bread for my A-Z International FlatBread and had clubbed it with No Onion No Garlic Kashmiri Dum Aloo. It tasted yum. Now though I wanted to make this bread with all purpose flour, I by default by practice took our Whole wheat flour and realized only later till I have kneaded the dough. I paused for a second, but then decided to continue as Noni Afghani is made using whole wheat as well as APF/Maida. 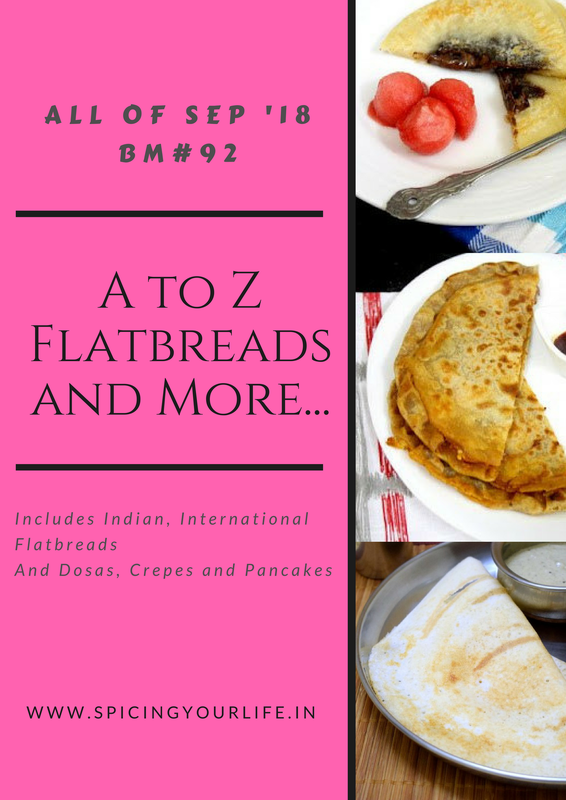 Noni-Afghani is thin, long and oval shaped flatbread made with All Purpose Flour or Whole Wheat Flour, topped with poppy seeds, sessame seeds, nigells seeds or a combination of this. Mix ½ cup of luke warm water, yeast and sugar and let it sit for 10 minutes. After 10 minutes the yeast should bloom. The mixture should appear frothy. If not discard the yeast and start again. Put flour in a large mixing bowl and sprinkle salt over it. Make a well in middle of flour and add oil and yeast mixture. Mix everything and add small amount of water. Knead the dough until you have a soft dough. Knead well for 5 minutes. Put a thin layer or oil all over and let it rise for 1-1/2 hours or until double in size. Roll each ball into an oval or cylindrical shape 6 to 7 inches long and ½ inch thick as per your liking. One can draw lines with a fork. I just pierced mine with a knife, so that it does not puff up while baking. Let it sit fir 10-15 minutes, so that it puff's up a bit. In the meantime pre heat the oven to 200 Deg C.
Just before baking, brush the top with milk. One can use egg too. Sprinkle the seeds and lightly tap it so that the seeds stick to it. Bake for 8-10 minutes until golden brown. One can grill on a pan too. Once done apply butter and serve with a gravy of your choice. I love baked flatbreads and this one is beautiful! Black sesame seeds would have given such a nice flavor to it! Awesome pick! The whole wheat version of the Afghan bread has turned out perfect. With dum aloo, this is a delicious meal for sure. Noni Afghani looks prefect to enjoy for a meal with any spicy side dishes. I love these sort of naan breads especially for our lunch or dinner. Noni afghani rocks. Fantastic bread. My husband loves such home baked breads. The few baked breads that I made for this series were all very much appreciated. Wow ! Love this Afghani naan with those onion seeds . The bread looks so pretty with these specks and that golden crust . Perfect meal to enjoy . Its amazing how flatbreads looks so similar but have different names depending on the regions. Making noni afghani with wholewheat flour is a good idea. Your preparation looks so soft. Its surely interesting that you pick up wheat flour. I would surely pick up maida hahaha…anyway I feel the breads taste little better when made with apf. However I can imagine it will be tough having it on daily basis. The Afghan bread has turned out so spongy. Good texture. Wow.. this bread looks so perfect from afghan.. and topping of black sesame seeds makes more attractive and add crunchy texture. This bread has turned out so spongy and nice. I never buy maida as I use it very rarely. Even for this marathon made almost everything with whole wheat flour! Love this whole wheat version of the afghan flatbread. It has come out so well. I am going to try this soon. Looks great, is this the texture raw type?? Great you have covered many international bread with your busy schedule. Great work done.